I've been seeing far too many new authors publish with vanity presses and spend huge amounts of money, when they could do it themselves for much less, and end up with a better book. 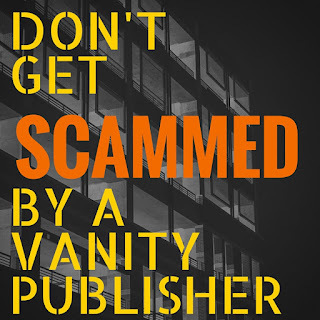 These "self-publishing houses" which promise to publish you for thousands of dollars are, IMHO (and I'm not alone in feeling this way) such a rip off! PublishAmerica (now remamed AmericaStar Books) - they say they are "free" but charge money for editing and more, and take control of your books. If you want to add one in the comments, feel free. There are more than I listed here. Let's compare what most of these guys are offering for $999 against what the real cost is when I self-publish. Sometimes these vanity presses offer "basic" packages for paperback and ebook for $699, or packages that essentially just format your ebook and put it up for you, for $499 (or this one that doesn't even offer everything on the list below). I've seen these books and IMO they almost always do a really bad job, and, there are tons of articles about how they don't pay the royalties they should, which you might want to Google around for. 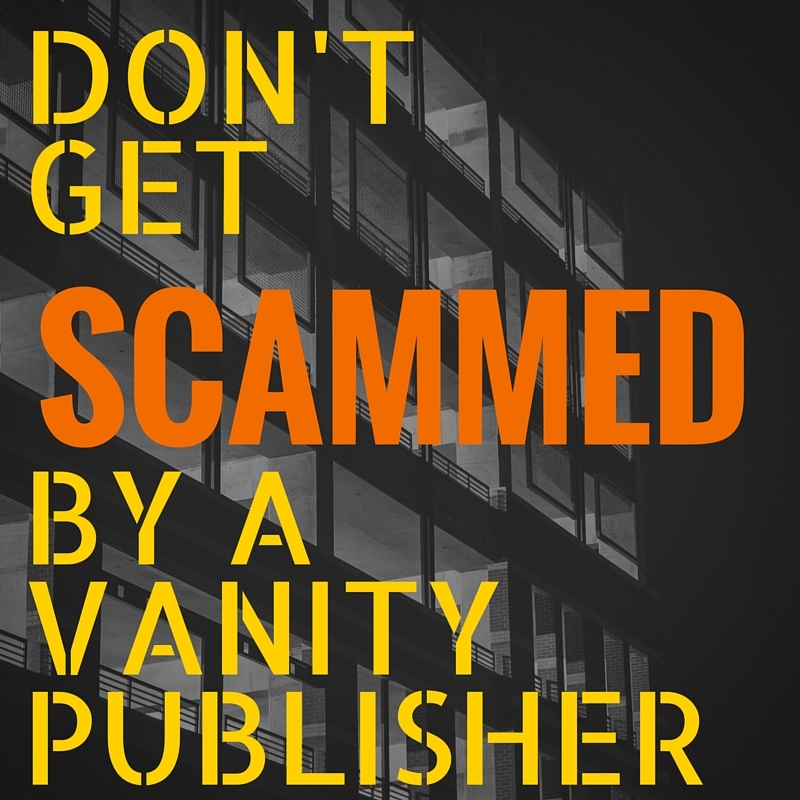 Just put the name of the vanity press + Scam into Google). and unlimited wholesale printing, fulfillment, and distribution via Amazon, Barnes & Noble, Ingram, Baker &Taylor, Bertram, and others: free with Createspace and Smashwords (to reach everyone on that list plus more, except Amazon), and Amazon, and B&N. Paperback formatting: real cost is $50 for print layout for Createspace at Ebook Formatting Fairies or use a company from Mark's List. Standard web page: free with Wordpress, or $50-$250 to have one made for you by Winterheart (I've worked with them before I started spending more money) $13 for custom domain name with GoDaddy. Get the domain for even cheaper with these promo codes. Cover (they offer a basic style you add your name to): To do exactly what the vanity presses offer, you can use the Createspace cover creator here for free. You can also make an ebook cover for free (or $1 per image or specialized text) at Canva. For a professional premade cover, most covers start at $69 for a one-of-a-kind cover from SelfPubBookCovers.com (full disclosure: I own that company, but you can go anywhere, it's your choice), or even cheaper depending on who you go with. Here's a list which includes cover designers and formatters, too: http://www.smashwords.com/list. Be prepared that many custom-designed professional covers cost around $200 and up. You can spend a lot on covers or nothing, it's up to you. 10 author paperback copies: costs about $3 per book using author discount at Createspace, so $30. In conclusion, they are offering for $999 what would cost you $130 total for ebook formatting and some author copies - the rest of the "package" is just free stuff already available to you if you know where to look, which now you do! You can get the same things, but WAY BETTER and more professional AND have pros do it all for you, for a grand total of less than $300 plus the cost of a cover (they aren't giving you a cover anyway, they're offering the same tool that you can get at Createspace cover creator here for free), but a pro cover adds anywhere from $50 to $250. So you'd spend a total of $300 - $550 (high end includes highest cost cover), and you'd have all the control, all the royalties sent directly to you, and have a better product. Hopefully this post will help new writers who want to self-publish and don't know where to start, save over $500. Hiring an editor is always a big add-on expense at these publishers, but you can hire your own developmental or line editor for much cheaper, and also get a better manuscript! I wish you all the best. My goal with this post is help other authors keep their costs down and avoid getting ripped off. An added perk of tackling independent publishing yourself: You learn the process from soup to nuts. That might sound like a lot of hard work, but the knowledge pays off on many fronts. There are plenty of things you might never be good at - designing covers, formatting print versions, etc - but you'll at least know how to get your hands dirty and be able to direct services you engage to polish things. There are also plenty of things you might really enjoy - setting up marketing campaigns, getting involved in blog hops, etc - that might turn out to be a marketable skill you can sell to fellow authors. If you do decide to engage a service company then do your research. Ask for portfolio pieces, references, and Google for feedback from other authors. Focus on things that matter: presentation, promotion, and sales. Be realistic about your financial investment because most authors don't produce much income from their titles. Leverage analysis from Smashwords like http://www.slideshare.net/Smashwords/new-smashwords-survey-helps-authors-sell-more-ebooks so you can see the real numbers. Some analysis on that same deck: http://www.huffingtonpost.com/mark-coker/new-smashwords-research-h_b_3278022.html It's incredibly hard to justify $999 on a service when you look at the reality of low yields in the first year of your book. It's money better invested in more writing! Totally agree, went with CreateSpace and ACX - self published, paperback and ebook, as well as Audio Book. Total investment about $400, this included 50 paperback copies (for promotion) I also went with a promotional text creation serviced. Pretty good overall. Publishing is constantly a painful issue for the writer, as they might be brilliant on writing, but suffers when it comes to decide the reproducing format, cover design and budget planning. The great news is, there are quality publication services arise nowadays to help you to publish your book in a quality yet cost-effective manner. Since I am secure assignment writer and providing assignment help online and I always self- publish my book. Traditional publication refers to the recognised system of receiving a book deal, which involves suggestion to managers over a period of time, usually a number of rejections and then being accepted. Self-publishing can be an attractive choice, but achievement is hard. As self-publishing budgets drop and digital chances produce, many writers are avoiding traditional publishing houses. I am also academic writer at Elite coursework help. Now a day fresh book publication offers authors more chances and an extensive array of options than ever earlier. Inventions such as e-book publishing and print-on-demand services have permitted authors who are unable to interest a traditional publishing house in their book idea to follow publication on their own, using either a Web-based publishing platform or a tradition printing service. Self-Publishing offers authors an opportunity to become published without the need of having to go through a storybook agent or a traditional publisher. This article on Self-Publish Your Book Inexpensive really make sense! I enjoyed reading it and I can share it with my CV maker team who provide CV writing services UK at CV Folks and see what their views are on it. Look forward to read more such blogs. Informative post on Self-Publish. Self-publishing is the fastest increasing section of the publishing industry; authors find it attractive for many reasons. I am also personal statement UCAS writer at Personal Statement Folks. Unlike using modern publishing companies, self-publishing allows the author to be in control of the entire creative and selling process. The High School Placement Test (HSPT) from Scholastic Testing Service also is used by Powered Essays features parochial schools and other schools for testing eighth graders for placement into high school. Anonymous - I suggest hiring a content/developmental editor, which is different from a copyeditor (that's who does the proofreading. It's different from a regular editor). But in order to get the book its best, you need to go in assuming that lots of things may change, may be moved around for clarity, etc. It doesn't matter if you think you "cannot allow pagination to be changed bc of cross-references" - that's old thinking. All you have to do is link the word that cross-references to another part of the book, and it will bring you there. There are no page numbers in ebooks. Besides, when you make a paperback book, all of the page numbers change anyway when it gets formatted for print!! So please, hire a good editor, and then let them do their job without giving them impossible edicts to follow, lol! If you use Xlibris they will call you weekly for the first year after publishing and then monthly for years on end to try and sell you promotional material (that doesn't work) and deals to bu more books. They're relentless. It is a pleasure to read such interesting and useful articles. I am so glad to be given a chance to read your wonderful article. I am looking forward to read more of your works and posts. Thank you for posting the great info. I was looking for something like this. I found it quiet interesting, hopefully you will keep posting such blogs. whenever i come here i feel so good, i really don't know that how much effort you put in this article and in this site but i can that saucony joggesko is really effective, That's why people are getting crazy here. Yes, that is so true! I think that it is one of the most important thing in being professional in whatever - to deal with critique and to change yourself wisely.